Some of you might have witnessed my latest silence and delay with planned releases. this is NOT the end of topheth prophet but a break I am taking due to other commitments (minor things like life work and family). some things needs to be done before I return to full activity. stay tuned. As it happens, I found myself watching the first episode of some random Sci fi TV series (I think it’s called ‘outcasts’). The picture fades in. A little child sees light through the morning landscape on the other side of his room’s window and shouts the William Blake’s poem that I have written above. The first thing that came to my mind, as it happens, even before my memories from being in his exhibition in London several years ago, was the brilliant book ‘Watchmen’ by Alan Moore, which used that same quote on one of its pages. It is a natural thing to happen, since Blake was represented and recycled infinitely through every medium and every genre (well, the darker you get, the most inevitable it is for you to cross path with an artist mentioning him), but there are rare moments when William Blake is brought to life in a refreshing, remarkable way, and Holism Gaea is responsible for one such beautiful moment. Drawing their translation to Blake’s book – “The marriage of heaven and hell”, Dekhay, who is behind this project and Kirpitch, who adds guitar and sounds on the third track, team up in order to conjure their vivid and powerful approach from reading his words. They say that it’s a game in hell and a hard work in heaven, but Holism Gaea works hard in order to paint the road to both the realms of darkness and light with vibrant sounds and deep voices. Unsettling sonic movements create a chilling world that crashes, like on “The argument”, with the charming serenity of paradise. The conflict and confrontation between these two realms of sound surrounds me as I am drawn into the spiraling storm, and in the middle of it, cold, desolate and beautiful, stands “Ah! Sunflower”, a poem that is brought out in a moment of distinct clarity through terrific vocals and music that manages somehow to send forth rich layers and textures, and keep this song intimate and almost naked. Few seconds before it ends, I suddenly realize I am about to be drawn back into the demanding and turbulent music that exists around this song. Like they say in this movie – we have to go deeper. I am able, and more important, I am more than willing. If you know Topheth Prophet and Heart&Crossbone, you know to trust their releases with blind eyes and stretched hands. The same goes with Holism Gaea, which ends up with another intense work that should not be missed, and that can’t miss. Magnificently maneuvering between the cosmic, the carnal, the epic and the spiritual, Blakesian Williamness will get you one way or another and bite you in the forest of the night. The art of William Blake finds its reflections in different creations all over the world for many years. It is really understandable, because the true genius usually lives for centuries influencing generations of people with its power and beauty. Of course, our post-industrial age cannot stand aside with such a rich theme to exploit and contributed lots of material that uses Blake’s visions and ideas. Though, the piece of art that I receive today from the duo under the name Holism Gaea is entirely different from what I’ve ever heard as an interpretation of “The Marriage of Heaven and Hell”. Hailing from Israel, the truly exotic area for industrial music, those guys certainly have something special in hand in the form of their first official album ‘Blakesian Williamness’. I am sure, that aerial environment affects ideas of specific artist and Holism Gaea is definitely that case. It is really hard to define a particular genre that the music of this record fits in. The total mix of cultures and influences flows out of my speakers from the very beginning. An opening track “Antares Fall” is based on a gentle Mediterranean melody creating an exotic basement for the upcoming action. Lots of additional special effects slowly enter the stage, atmospheric disturbances, different scratches and pulsations, waving noisy sounds, all of them fill the air with a thick and colorful soundscape. The long eighteen minutes composition fades away with a total cacophony of those effects, squeezing the conscious to the size of a small point. Different ticks and clicks alongside with some airy pulsations expand the universe back to the level of “But in the Wine Presses”, where analog noisy instrumentation swoops up the immortal words of William Blake’s poetry through the voice of one of the members of Holism Gaea. What I’ve heard until now reminded me strongly of Legendary Pink Dots, and this voice strengthens this impression being very similar to Edward Ka-Spel. “Ah! Sunflower” takes the music even higher with 70’s psychedelic rock influences that is driven with different noises and very dirty pulsations in the vein of early Young Gods and Phallus Dei. This composition is a really important part of the whole album, injecting wide colorful textures together with a mechanical resonance that is felt much stronger in the following track “The Human Grapes Sing not nor Dance”. A storm of sounds and electronics is blown through this track; randomized wave of energy captures me into the deepest void of desperation and sorrow which is uncovered through the gentle “The Argument”. While Blake’s poetry is back again adding from its beauty to the extremely creepy atmosphere, the duo continues their manipulations with naked feelings, pressing the buttons of pure emotions. The album ends with “Weeping Meadow”, a track on the edge of white noise which I personally didn’t like too much because of its long running time and high density, full of radio turbulences and Brownian motion of electronic elements. So yes I was silent for a while , but this is the first short update for 2013.
plans for this year are a Con Dom reissue to be released hopefuly by June,followed by a new Nimh release. I am very happy to release both cds are these are two fantastic artists and both releases are great. 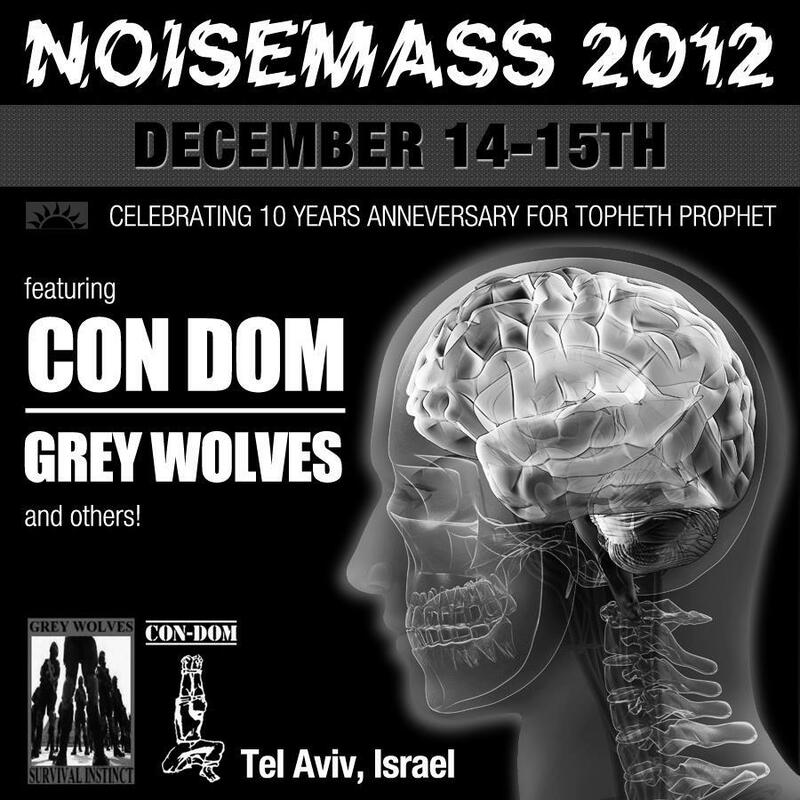 meanwhile I am working on 2013 noisemass and preparing some surprises… stay tuned. btw I have updated the releases page with the latest releases from last year. both Zion Sky comp , Holism Gaea debut are worth attention. TP023 – Mourmansk 150 Yes We Conflict CD Out now ! The long awaited second M150 Release on topheth prophet is finally out there! 14 Tracks including collaborations with topheth prophet artists KADAVER , Anemone Tube as well as Antrecot & Sewer Goddess. I am sure that each of us tried to comprehend his influence on the world around at least few times in his lifetime unless he is a complete piece of garbage that doesn’t care about anything around but his egocentric self. Do you choose a materialistic life approach, consuming without any visible borders, sacrificing all that remains precious for voracious curiosity? Or maybe you are concentrated on spiritual and divine side of existence, hugging everything around, sharing love and positive energy? What can be certain is that whatever path and behavior you will choose at the specific stage of your inner development, one of the questions that you will definitely ask will be about the visible (and invisible) exploit of natural environment, the way you utilize your abilities towards preserving life for the future generations. And I don?t mean it in global context; I am not asking everybody to be some kind of a saint or prophet… But you know what, I want my words back, because I do ask for a basic responsibility of each of us for our deeds; they have a massive influence when they are being processed through a social mechanism, where macrocosm is a mosaic of myriads of microcosms. Anyhow, when talking about modern society, it can be clearly noticeable that a constant chase after industrialization which had become almost a synonym of “global progress” demolishes, disintegrates, and corrupts all the natural environments that are not less important for the development of a healthy modern society. The most outstanding example is China, the country which made a huge breakthrough during last 20 years without paying any attention to the damage that was done during that process. Is it all about “living here and today and after us the deluge”? Fortunately for this world, there are enough people that can set a counterweight to all that never-ending misery. You can find results of their activity in most unexpected places and manifestations. 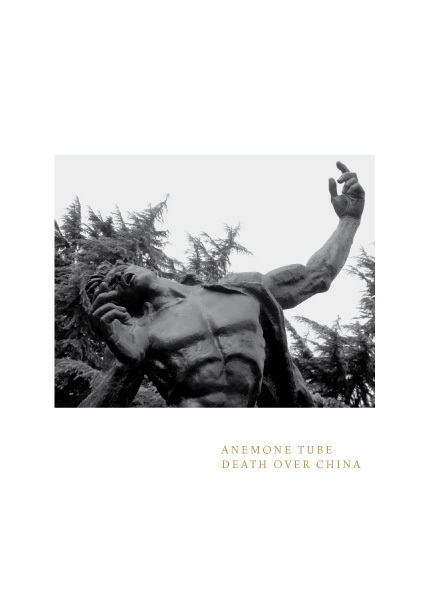 Stefan Hanser aka Anemone Tube, a Berlin based resident, decided to reflect this theme in a solid piece of experimental music that received an appropriate name “Death Over China”. Being deeply impressed by the level of human blindness and unawareness during his journey to China, he decided to collect ambient sounds and create some kind of an exotic ?photo album? that would capture not visual images but the atmosphere itself. Focusing on manipulation with field recordings, Stefan creates an extreme sonic soundscape full of power and rage. He also shows that creativity has no boundaries while raw sound is sometimes more than enough to reveal many special moments. Try to enter a crowded market or maybe a working plant and open your mind towards music of life, towards a huge pallet of different noises, try to distinguish harmony and feel the pulse of the day. “Black Death Rise” is all about such an effect, constant noises and disturbances are bound together, cycling back and forwards, creating some kind of a rhythm with a weave drilling, shrinks, human voices and many many more. “Deathly Kingdom of Desire” and “Prayerwalk” continue the same idea, but this time with a pack of atmospheric synths that can be heard at the background while all the environmental cacophony receives some treatment from our German comrade. Don’t get relaxed that fast, because “Brooding Haze” raises the level to reach a melting point of power electronics with a wall of metal scratches, dirty pulsations and the whole range of static electricity. Cyclic heavy drones drive the composition forward; even when I know that all the sounds are mostly accidental, I start to feel a breath of some kind of artificial life form that lives in a symbiosis with visible spectrum, feeding on our dreams, hatred and illusions. The intensity is being changed at this point with “The Announcement” being mostly dark ambient track, though all the elements that were described above are there too but without heavy electrical drones. Same ambiance and same samples adding a tangible cinematic component create a dense delusive atmosphere. And as the finishing stroke, Stefan drops the listener into the cold sensual experience of “The Desecration from Within”, the track which is very close to more classical templates of power electronics genre. High frequency disturbances, metal shrinks, background metal percussion, and above all this salad is a chanting voice, reading some oppressive texts. Without any doubt, Anemone Tube hands out a strong statement hammering a set of uncompromising material. I was captured by its atmosphere and structure, listening to the album in one breath; and that is really important because the theme demands a certain level of concentration and a special spiritual mood. I am not sure that it is the best experimental album that I’ve heard in my life, but I must admit that it is one of the most sincere and honest out there. As for me, I am convinced now that humanity is a true disease for the earth that it exploits. And what about you? Anemone Tube is a German project which started out in 1996, and is counting several releases and collaborations between 1997 and 2003. After that a 7-year break ensued, and the project appeared again in 2010 with “Dream Landscape”. “Death Over China”, co-released by Israeli label Topheth Prophet and Belgian label Silken Tofu, follows immediately after that, signifying a new era of productivity for Anemone Tube. It’s a limited edition of 731 hand numbered copies, and it comes in a 5 panel folder with a 19 x 14 cm metallic/black print, packaged in transparent bag. In the artwork is included the painting “Ulysses and the Sirens” by H.J. 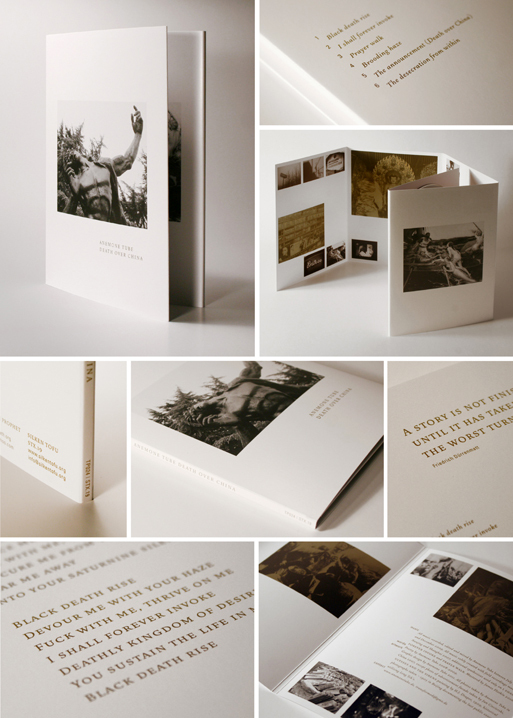 Draper, a photograph by Jan Ciecierski, poetry by the artist, various photographs taken in China in his 2007 trip, as well as historical photographs taken around 1905 in Beijing, which depict the last public execution employing the especially cruel method of Leng T’che (the slicing of parts of the body, with the purpose of torturing the person to the extreme, and delaying the penalty of death). Now these are extremely shocking photographs, certainly not for the fainthearted – you have been warned! “Death Over China” is comprised entirely of field recordings made during the artist’s trip in China in the year 2007, more particularly in Nanjing and Shanghai. Additional synthesizer is used only in “I Shall Forever Invoke” and “Prayer Walk”. Despite the manipulation done on the field recordings, the original ambience of the places is retained, to a degree where a complete traveller’s impression can be conveyed through the album. A somewhat distorted impression for sure, and one that digs too deep under the surface for comfort, but an impression nonetheless. Its trademark is a combination of brutal, grim noise, recorded sounds, spoken word and machinery turned into heavy, slow rhythms. Other unidentified sources provide a multi-layered complexity. A distinctive trace of dark ambient melodies lurks ominously in the background, giving a cheerless, despondent tone to the whole. Anemone Tube uses field recordings masterfully, reaching down into their inner core, surgically removing and replacing the various elements to bring to the surface their true spirit. “Black Death Rise” begins calmly with traffic sounds from a nearby street, and slowly introduces us to the rhythmic use of found noise sources. Harrowing screams can be discerned in the background, and a monotone male voice loops over the rhythms, resembling the hypnotic chants of an urban shaman. “I Shall Forever Invoke” begins with the utilisation of patterns very similar to the previous track, adding more layers and cautiously increasing its volume, while the sharp metallic sounds and its fiendish melody inhabit an imaginary scene. In “Prayer Walk” a female voice loop prevails, repeating a public announcement. A guide from beyond, it carves a path through an infernal, frightening landscape, while static noise moves frantically, imitating the howling of the wind. “Brooding Haze” is an entanglement of many different sounds engaging in a demonic dance, the back and forth of its tempo resembling the ebb and flow of the tide of souls, the internal heartbeat of the city. In “The Announcement” the dark ambient elements of Anemone Tube’s music are more easily perceptible, as the track contains the least amount of noise in comparison to the rest. Droning and voice samples create a varying, desolate landscape, a ghostly emptiness from where occasionally spring the remnants of hope. A hope soon to be irrevocably crushed in “The Desecration From Within”, a massive wall of rhythmic death industrial, the grandiose, military air and relentless repetition of which cry out “utter annihilation”. Undoubtedly the best track of the album, and one of the best I’ve ever listened to. In the unlikely occasion of the rest of the album failing to grab your attention, this one surely will. The combination of Draper’s paintings with the title, the overall atmosphere and the disturbing pictures of public torture, facilitates the apprehension of the concept. Death hovers over China like the ancient, eternal creature that he is, and the impressions he receives surpass the boundaries of time, in an admixture of past, present and future. Locations are haunted by their historical significance, countless little incidents, and just as many big ones, all merge under the darkness of Death’s wings. His presence can be actual, metaphysical or symbolic, can be distinguished in an individual as well as a collective level. It is found in the demise of matter, the corruption and decay of human flesh. In pain, chaos, confusion, fear. In the crushing sounds of an insatiable industrialisation, replacing memories with structures, beauty and natural order with mechanical production, human nature with its hybrid counterpart, a creature half-engine, half-man, carried away by Death’s alluring song, merging with the functions of the machine. Because the demands of life are also the demands of death, what is born must necessarily expire. Death is the ultimate ruler of all. We must necessarily succumb to life’s charms, and the moment we do so the idea becomes reality, the image becomes matter. Each beginning is indeed, an end. That is of course, an interpretation based on my own imagination – you may very well apply your own. The fact remains however, that “Death Over China” is painfully alive, bursting with the agonizing tension of such an understanding. It grips the listener with admirable force, never letting go until the 45 minutes of the recording are over. Its devastating voices, hopeless atmospheres and stifling, crushing noise are parts of the monstrous, roaring machine that destroys everything in its path, laying its wheels sluggishly on the dusty, blood-stained ground. The screams of the perished souls pierce the air in a hellish crescendo. Despite the fact that extinction is sure to follow, you cannot help but be enticed, and willingly, even excitedly, approach it. Behind Anemone Tube is Stefan Hanser, a gifted musician who might not release much, but always astonishes with the sounds that hit the street as well as his live-performances. Being a co-production between the Belgian Silken Tofu and the Israeli Topheth Prophet, “Death Over China” is actually the first full-time album since 2001 by Stefan alone. In between he did release some collaborations – one of them with none other then Christian Renou of Brume fame – and only last year a mini CD with DVD were released by the before mentioned Silken Tofu. So a full album, being as beautifully designed as this one, gives us high expectations. And all of them are without any doubt fulfilled to the maximum. 45 minutes are divided into 6 tracks and starting with the first tones in ‘Black Dead Rise’ we are guided by an obviously gifted musician through a part of the world where things aren’t as they seem. The music is a combination of well chosen, found and recorded sounds, beautiful pads and sounds in well arranged compositions, topped with aggressive and intriguing noises of unknown origin. The constant shifting of layers makes each track a little party in your brain, because at the moment you think you’re “in”, you notice there as been changes in other perspectives or layers of that track you’re listening to. “The Desecration From Within” is the final track of the album and from a combination of drones, ambient and noisy soundscapes which made this album a beauty to begin with, suddenly the music turns almost into power electronics! With this last track Anemone Tube shows us that he is capable of way more then what we could expect to begin with. The field recordings were recorded in China on a trip Stefan made in 2007. That same trip was the time when he made the pictures which form the base for the artwork, which shows his professional background / daytime job as a graphic designer as well. I’m glad to see AT is getting more attention that it used to. To me, this album is one of the proof how modern technology can work well for experimental music when used well. Anemone Tube has nearly completely abandoned synthesizers and focuses on treatment of field recordings. Clarity and texture of various sounds recorded in his trips in China perhaps could not have happened in times when portable high quality gear was expensive and perhaps too big to carry in your pocket. Possibilities to edit and layer sound on software allows many possibilities to fail, yet also many possibilities to adjust and take care of every detail. Despite sources being a collection of every day life, we aren’t talking of academic sound art. Death Over China is most of all post-industrial release… whatever that means anymore? It’s structure has more common with genres of dark ambient, death industrial and such, but simply textures of material is much more interesting than the traditional keyboards and rhythmboxes. Extensive usage of loops and effect heavy processing still allows the natural sounds come through, and this is absolutely the strength of this album. It may carry the cinematic feel, occasionally nearly soundtrack type atmosphere, but isn’t cheesy. Cover is like previous album. Multi-panel DVD size cardboard sleeve, with golden printed poetry, photos related to the music. I played this album 5 times without removing it from CD player. And it still makes me want to listen it again. I’m sucker for loops and physical sounds. If one has to go and find negative sides, perhaps next time Anemone Tube will be able to create pieces with more drastic shifts or modulation within the track itself. This is often faulty of digital layering, where density of loops may appear to be enough, but after repeated listens, you feel the hand crafted unpredictable movement to unknown ending of track would be nice. Instead of elements just being there until song ends. Almost like it started. From his travels in China, Stefan Hanser brought not only a set of recordings made by them on busy streets or in the quiet temples, but also a sense that this country like no other, a country of contrasts. In the design of the booklet «Death Over China» this is expressed by an impressive array of images – prayer plaques, cheerful advertising and sketches from living side by side with the average citizen photos of public executions and other fanaticism, until recently included in the compulsory program of life in Chinese society. Hanser is using only field recordings (plus ambient synthesizer sketches add to the mood of a couple of things), collecting from them is not “travel photos on memory,” a very extreme music, exciting styles are related, as the power electronic, noise and dark ambient with the monotonous roar metal objects and static pressure of flow noise, which is rushed from one stereo channel to another. Turned apocalyptic sketches, a collection of familiar urban and rural sounds, mixed together, forming long loops of moving voices and din of different mechanisms, frightening and mesmerizing at the same time. Mind you realize that this is – only speaker in the square, shouting torgovok street, rattling the old bikes, which lead to the spokes of an iron rod, the signals of automobiles and other everyday sounds, but when it’s all condensed into such hatred and malice charged segments, «Prayer Walk »with its rough, electronics or« The Desecration From Within »(real noise martial with pretentious declamations, echoing the rhythm of marching and fine dispersion noise, the cutting of the brain), you begin to feel at least uncomfortable. The balanced chaos «Anemone Tube» listen to in one breath, making follow all the mutations and unexpected sound alliances. Industrial from field recordings, musique concrete, pulled out of the history of the whole country, most unsightly (or, conversely, evoking pride of its inhabitants) moments – in any case, it’s definitely worth a listen. Shake. TP022 Malben – We Disappear Into Nothing Out now!! “We Disappear Into Nothing” is the second album by newcomers Malben. the album was recorded live in Jerusalem on August 2010.
oversize folder with elegant black/metallic print. Andrea Marutti’s latest musical collab with Davide Del Cole is a welcome contribution in the development of sci-fi ambient minimalism. The two musicians are renowned sound alchemists who produced a handful and wide range of electronic materials / soundscapes under their own name or for collective musical projects (Hall of Mirrors…). In this new promosing project, they demonstrate a great hability to experiment “spatial subjectivation” focusing their object on hypnotic patterns, tonal clusters and haunting acoustic vibes. The intention of Utopian Suns is to create neutral-fundamentally harmonics and expressive dronescapes which reveal a pure level of static consistency. From the phenomenological side of meaning these granular soundscapes can be perceived as elementary meditations on the perceptual phenomenon, silence, temporality and culture of repetition. each track installs the listener into a large empty space where the feeling of real time is preserved, restored and re-inforced. The sound spectrum is constantly voluminous and sonorous, admitting subtle interferencies, micro transitions, extended lines, reverb scintillations. The deeply spatial / sculptural aspect of compositions implicitly approaches the aesthetic sensibility of early pioneering works in post-modernist minimalism (Alvin Lucier, Phil Niblock…), giving to the ensemble a very cohesive-symbiotic spectromorphological dimension. The self title track is a stunning, subliminal dreamy like soundscape punctuated by breathing minimal melodies. To say the least, Utopian Suns is a luxurious, everlasting and fascinating textural ambient droning effort. According to me and due to its warm-cristal like waves this album also appears to be highly recommended for beginners in this specific musical subgenre. Molnija Aura is an electronic ambient/glitch project of Davide Del Col and Andrea Marutti from Milan, Italy. “Utopian Suns” is the project’s first full-length album. Recorded and mastered between 2007 and 2009, the CD is inspired by science-fiction themes and space-age relics. Consisting of six tracks created mostly with analogue and digital synthesizers, the album is a long and engaging journey through sidereal dephts: shrouded in the darkness of immense and untouched vastness, beyond the great unknown, hovering in the void of zero gravity landscapes explored with slow and unreal movements. The uneasyness of silence and the absolute void of impenetrable gloom, the infinite and overwhelming distances, the fear of solitude and isolation, the anxiety of no return… And then the emotion of discovery: other worlds, unknown universes and impalpable beings, undefined and unidentifiable entities, close encounters, the unutterable and the unthinkable. Molnija Aura trace new and absorbing lines, and set a wider border to that area of electronic music inspired by space exploration, astronomy and science-fiction. “Utopian Suns” is a must for all those interested in Dark Ambient, harmonic resonating drones, eternal reverberating cold soundscapes, and atmospheric dilated sequences. Right after his collaborative effort with Fausto Balbo, Andrea Marutti returns with a brand new collaboration that bring him crossing his knobs with Davide Del Col, some of you may remember for a couple of wonderful works with Ehran and for his work as Ornament. This album brings together a couple of musicians quite renowned for their recent dark ambient past but differently from what one may expect this’ much more than that. Infact even if they’ve kept their dark roots on board, they overabundance of space synths paints the atmosphere of a strange space color. Even if this record has nothing to do with that, it reminded me of Brian and Roger Eno in their Apollo album, probably the space imaginary made me wrote this, but later while giving a look to the layout I’ve noticed they’ve put space satellites everywhere, and maybe I’m not that wrong. There’s a a great use of melancholic litanies pulsing underneath and during the first listening it didn’t emerged completely, later when I’ve had the chance to give the proper attention to the work it surprised me. I’ve been listening to this work at night while trying to catch some sleep and believe me, there’s no better soundtrack to meet Morpheus’ embrace. e sleep and believe me there’s no better soundtrack to meet Morpheus’ embrace. Ausnahmekünstlers Andrea Marutti, das er mit seinem Landsmann Davide Del Col verwirklicht, der vor allem durch seine Solopfade unter dem Namen Ornament & seine Mitarbeit bei Echran (in Kooperation mit Fabio Volpi) auffiel. “Utopian Suns” hätte auch gut über Afe Records, dem Label von Andrea Marutti erscheinen können, erblickte aber anstand über die israelische Manufaktur Topheth Prophet das Licht der Welt, wo es sich nahtlos in einen von heimischen Interpreten geprägten Backkatalog einreiht, der seit 2002 stetig wächst. Als Inspirationsquellen dienten dem Duo die Themengebiete Weltraumforschung, Astronomie und Science-Fiction, welche schon unzählige Protagonisten vor ihnen im (Dark) Ambient verwendeten, um Hintergründe für ihre einnehmenden Kopfkinofilme zu schaffen, die aus dem tristen Alltag in unendliche Weiten entführen (und meist zur Entspannung beitragen). In Punkto Tonkunst kreierten die Herrschaften eine höchst atmosphärische Symbiose der Stile Ambient und Glitch, deren Dichte wie eine Würgeschlange ihre Beute erdrückt & verstörte bzw. total faszinierte Konsumenten hinterlässt, wenn sie sich vollends dieser mitreißenden Sounds ergeben, wovon man am Ende durchgeschwitzt wie komplett entspannt vor den Lautsprechern der heimischen Anlage verharrt – Wahnsinn! Zwischen 2007 – 2009 entstanden diese 6 Tracks mit einer Spielzeit von knapp über 1er Stunde, welche von Anfang bis Ende eine brillante Ausgewogenheit von tiefen Bässen aus der Electronica mit teilweise meditativen (dronigen) Klangflächen des Ambient verschmelzen, die die Südländer mit vereinzelten Noisesequenzen akzentuierten, wodurch sich eine atemberaubend wie ausdrucksstarke Masse ergibt, die auch nach dem x-ten Hördurchlauf noch abheben lässt! Wir reden oft über das musikalisch perfekte Album, ein Terminus, der auf das Debüt “Utopian Suns” von Molnija Aura zutrifft, das in jeder Sekunde überzeugt wie bewegt! PS: Bitte sofort die Arbeiten zur nächsten Veröffentlichung aufnehmen!